This cake is the chocolate pool. You can name it whatever you want but would not deny calling it a chocolate paradise on earth. The luscious taste chocolate can do wonder to the taste buds. After one slice smudged chocolate mouth will ask for more and more. Take a dive in this chocolate pool and get lost in the world taste. The dark chocolate is the type of chocolate which has a higher amount of cocoa powder. The high range of cocoa ensures the quality of chocolate. All layers are iced with a huge amount of dark melting chocolate. The dark chocolate cake is the invention of those who wanted to maintain a healthy bonding with chocolates. The dark chocolate is made from cocoa butter instead of milk-based butter. This cake is healthier among all chocolate types. This chocolate rich cake is the mud of chocolate. This chocolate mud is made from flour, butter, sugar, eggs and lots of chocolate.Top of the cake is frosted with soft melting chocolate and swirls too are of the soft melting chocolate. 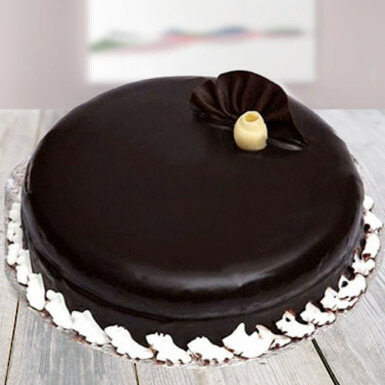 This rich chocolate pool cake can be shaped into any desired shape that means you can have the cake shape of your choice. Every bite of this cake contains a huge amount of mouth-watering rich chocolate. Customizations are available. Extra charges will be charged for changes. Eggless cake is also available and for this you have to click on checkbox button. Chocolates are mostly every person’s first friend. Chocolates are the best gift one can ever have. This dark chocolate cake is the best option to pamper every person at the top level. This dark chocolate cake can make smile wider. A personalized message on this chocolate pool can leave your loved ones amazed. Order this cake on any special occasion and compliment people for their love. Parents, siblings, beloveds, office colleagues, friends and everyone else will be happiest after receiving this chocolate pool. I ordered this cake online on behalf of my kid for her Grandfather. The cake was good however the message was wrongly spelt. Big goof-up. Great Look & great taste !!! Thank you Winni. Thanks for the promt and great delivery !